Common Trumpet CreeperDeciduous vine. Very fast rampant growth. Orange-red trumpet shaped blooms mid..
Monbal Trumpet CreeperDeciduous vine. Fast growth. Bright green foliage. Large, tubular, deep reddis..
Flamenco Trumpet CreeperDeciduous vine. Fast growth. Bright green foliage. Orange/red blooms in the ..
Indian Summer Trumpet VineDeciduous vine. Fast growth. Clusters of orange-red trumpet shaped flowers..
Madame Galen Trumpet VineDeciduous vine. Vigorous grower. Shiny green leaves contrast with clusters ..
Trumpet VineDeciduous vine. Fast growth. Clusters of yellow trumpet shaped flowers in late spring to..
ClematisDeciduous shrub. This clematis does not cling or climb. Stems are self-supporting at first a..
ClematisDeciduous vine. Soft green foliage. Large, single, flat deep purple flowers bloom in mid sum..
ClematisDeciduous vine. Dark green foliage contrasts with beautiful rosy-magenta/lavender semi-doubl..
ClematisDeciduous vine. Dark green foliage contrasts with glowing crimson-red blooms. Blooms in earl..
ClematisDeciduous vine. 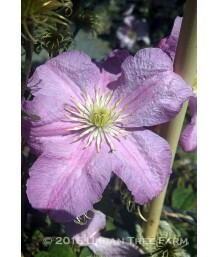 Dark green foliage contrasts with 6 inch pink blooms with a dark pink bar do..
ClematisDeciduous vine. Green foliage contrasts with large 4"-6" rose pink flowers and yellow stamen..
ClematisDeciduous vine. Fast grower. Fully double flowers are bright white. Blooms late spring to ea..
ClematisDeciduous vine. Compact habit. Pale blue 4 inch flowers in late spring and early summer. Sof..
ClematisDeciduous vine. Green foliage contrasts with large 5"-8" soft purple blossoms. Blooms in ear..
ClematisDeciduous vine. Moderate growth rate. Needs trellis support. Profusion of medium-sized purpl..
ClematisDeciduous vine. Soft green foliage. 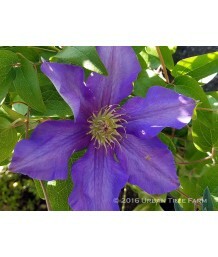 Large, single, dark lavender flowers bloom in mid summer..
ClematisDeciduous vine. Green foliage contrasts with large 5"-7" rich deep purple blossoms. Blooms h..
ClematisDeciduous vine. Moderate growth. 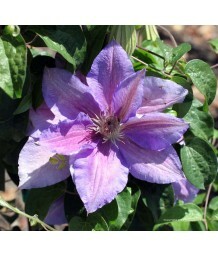 Blue blooms appear in late spring and rebloom through summe..
ClematisDeciduous vine. Moderate growth rate. Very large pure white flowers with striking dark stame..
ClematisDeciduous vine. Moderate growth rate. Needs trellis support. Profusion of very large white b..
ClematisDeciduous vine. Moderate growth. Soft green foliage. 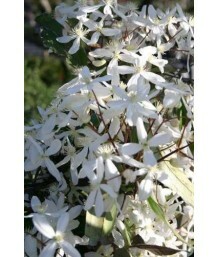 6-7 inch white flowers are frosted with..
ClematisDeciduous vine. Soft green foliage. 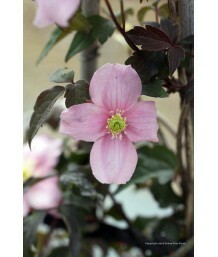 Large, up to 9 inch deep pink flowers with lighter pink ..
ClematisDeciduous vine. Soft green foliage. Large, dahlia-like, double flowers blend cream, green, l..
ClematisDeciduous vine. Moderate growth rate. Soft green foliage. Large, soft blue-violet flowers wi..
ClematisDeciduous vine. Moderate growth. Pink and magenta flowers with light colored edging. Rebloom..
ClematisDeciduous vine. Moderate growth. Large rosy pink and mauve flowers. Reblooms. Regular water ..
ClematisDeciduous vine. Moderate growth. Rich pink star shaped flowers with white stripe. Repeat blo..
ClematisDeciduous vine. Moderate growth rate. Needs trellis support. Soft green foliage. Semi-double..
ClematisDeciduous vine. Fast grower. Single bloom flowers are striking pure white. 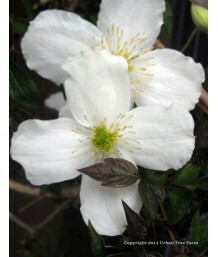 Blooms late sprin..
ClematisDeciduous vine. Moderate growth. Large wavy lavender flowers bloom late spring to early fall..
ClematisDeciduous vine. Fast grower. Satin white flowers with red centers. Blooms late spring to ear..
ClematisDeciduous vine. Moderate growth rate. Needs trellis support. Profusion of pinwheel shaped li..
ClematisDeciduous vine. Blooms from May to June then again from July to September. Flowers are dark ..
ClematisDeciduous vine. Moderate growth. 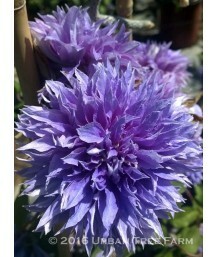 Large dark blue flower, sometimes double. Blooms and rebloo..
ClematisDeciduous vine. Fast growth. Pink flowers with dark pink stripes. Blooms in late spring. Woo..
ClematisDeciduous vine. Fast growth. 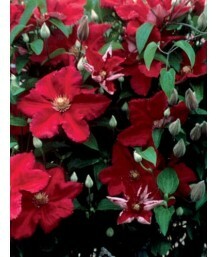 Large, velvety, ruby red flowers that bloom from May to Septemb..
ClematisDeciduous vine. Fast growth. Large blue flowers bloom mid summer to early fall. Regular wate..
ClematisDeciduous vine. Moderate growth. Blooms and reblooms a deep purple-blue in early summer and ..
ClematisDeciduous vine. Fast growth. Blooms from May to June and again from July to September. Flowe..
ClematisDeciduous vine. Moderate growth rate. Needs trellis support. Soft green foliage. Hanging, op..
ClematisDeciduous vine. Soft green foliage. Large, single, pale blue flowers bloom in mid summer thr..
ClematisDeciduous vine. Fast growth. 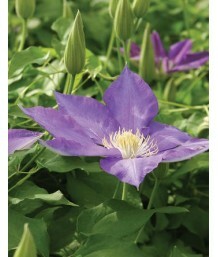 Bell shaped purple-blue flowers bloom early May through Septemb..
ClematisDeciduous vine. Fast growth. Crimson red flowers bloom from July to October. Attracts hummin..
ClematisDeciduous vine. Fast growth. 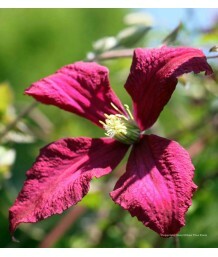 Blooms burgundy-red with a magenta stripe from May to Jun and a..
ClematisDeciduous vine. Moderate growth rate. Needs trellis support. 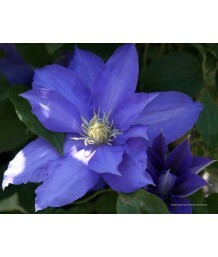 Large deep purple-blue flowers ..
ClematisDeciduous vine. Fast growth. 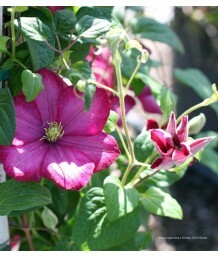 Blooms single light purplish-rose flowers with rose-link center..
ClematisDeciduous vine. Fast growth. Blooms bright purplish-red flowers with pink stripe from July t..
ClematisDeciduous vine. Fast growth. Blooms lavender to light blue with overlapping, wavy petals. Bl..
Blue Dancer Alpine ClematisDeciduous vine. Soft green foliage. Nodding, bell shaped violet-blue flow..
Evergreen ClematisEvergreen vine. Fast growing and vigorous. Needs strong support structure. Profusi..
Evergreen ClematisEvergreen vine. Dark green foliage contrasts with exquisite pink buds opening up t..
ClematisDeciduous vine. Dark green foliage contrasts with an abundance of white blossoms. Blooms in ..
ClematisDeciduous vine. Dark green foliage contrasts with an avalanche of white blossoms. Blooms in ..
ClematisDeciduous vine. Moderate growth rate. Needs trellis support. Masses of smaller purple flower..
ClematisDeciduous vine. Moderate growth. Soft green foliage. Velvet purple flowers bloom from late s..
Pipestem/Chaparral ClematisDeciduous vine. Fast growth. California native. Blooms April to May with ..
Virgin's BowerDeciduous vine. Fast growing. 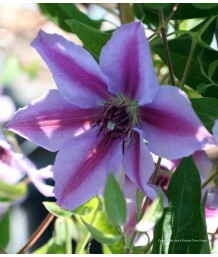 Blooms from June to September with small, fragrant, crea..
ClematisDeciduous vine. Fast dense growth. 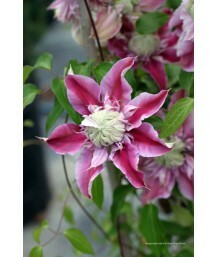 Blooms satin pink vanilla scented flowers through May and..
ClematisDeciduous vine. Fast growing. 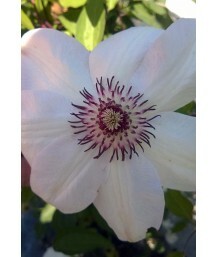 Blooms in summer with sweet smelling pink anemone-like flowers..
ClematisDeciduous vine. Fast growing. 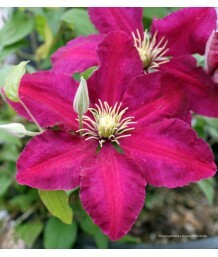 Blooms dark pinkish-purple sweetly scented flowers in late spr..
ClematisDeciduous vine. Fast growth. Blooms small white flowers that are said to smell like hot choc..
ClematisDeciduous vine. Fast growth. Blooms fragrant small white flowers in spring. Regular water ne..
ClematisDeciduous vine. Fast growth. Blooms small fragrant white flowers from May to June. Regular w..
ClematisDeciduous vine. Fast growth. Blooms yellow bell shaped flowers in mid to late summer. Fuzzy ..
ClematisDeciduous vine. Fast growth. Blooms red bell shaped flowers from midsummer into fall. Regula..
ClematisDeciduous vine. Fast growing. Blooms pink tulip shaped flowers from summer into early autumn..
ClematisDeciduous vine. Fast growth. 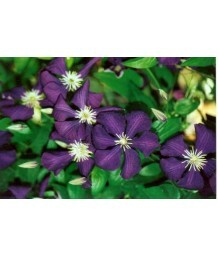 Dark purple, slightly nodding flowers have a white and yellow c..
ClematisDeciduous vine. Fast growing. Blooms deep purple flowers with gold tufted centers in midsumm..
ClematisDeciduous vine. Fast growing. 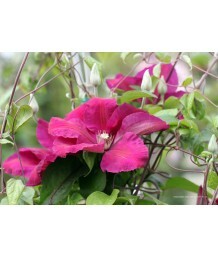 Blooms showy reddish pink pin-wheel shaped flowers from elegan..
ClematisDeciduous vine. Fast growing and vigorous. Needs trellis support. Abundance of smaller purpl..
ClematisDeciduous vine. Green foliage on vigorous vine. 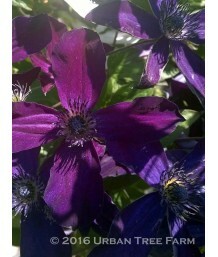 Profuse blooms of vivid deep velvety purple ..
ClematisDeciduous vine. Fast growth. 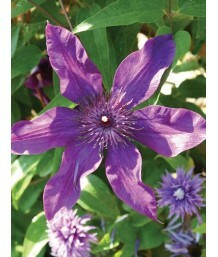 Blooms dark purple from June to September followed by attractiv..
ClematisDeciduous vine. Fast growing. Soft green foliage. Blooms wine-red to purple star-shaped flow..
Violet Trumpet VineEvergreen vine. Moderately fast growing. Needs support structure. 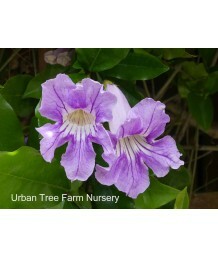 Medium sized la..
Violet Trumpet VineEvergreen vine. Already trained to grow on a trellis. Moderately fast growing. Ne..